This dirt trapping commercial door mat has the elegant look of a patterned entrance carpet with the ease of maintenance needed for public use. 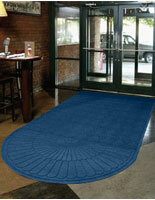 Each 4' x 5.9' doorway rug is made from durable polypropylene with a unique design that traps dust, debris and water. 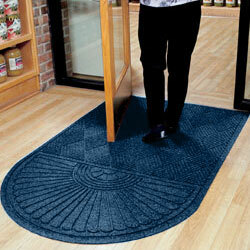 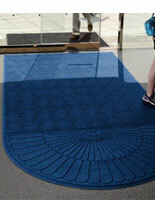 The stylish indigo blue commercial door mat is designed to help keep entry and doorways clean and tidy. 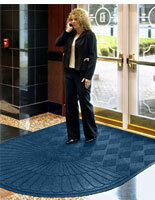 Each facilities accessory is has Anti Slip Certification from the National Floor Safety Institute, and is anti-static rated to 1.2KV by the AATCC. 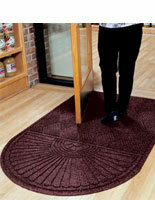 These business grade door mats are perfect for use in high traffic building doorways and exits. The rug's unique construction and stylish color give a classic feel to entrances while helping reduce contaminants, spills or stains.